Today I am leaving for Tuscaloosa!!! I am moving in tomorrow morning. :) Be sure to follow me on Twitter and add me Snapchat to see all the behind the scenes of today. I am so excited to get settled and have everything put together after having it all sit my room for the past month. 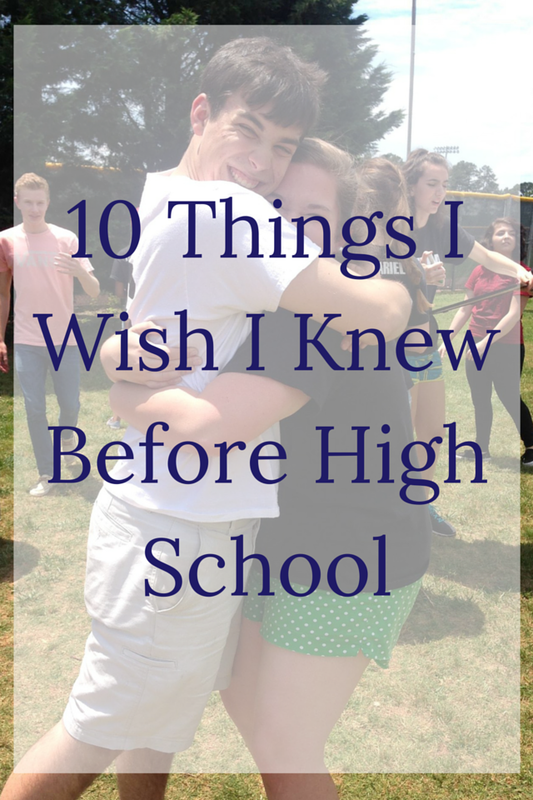 My high school actually starts school on Monday (Shout out to my mom for moving me in right before her year starts), so I thought I would take today to talk about what I wish I had known before I started high school. I had a pretty good idea of what I was getting into considering my brother and sister are six years older than me and my mom works at my high school, but even with all that amazing wisdom, there were some things I wasn't prepared for/I didn't listen to. Hopefully today I can impart a little bit of knowledge with y'all to help everyone who is heading into high school. Try everything at least once. | One of my biggest regrets from high school was not getting involved in our drama department. A ton of my friends were theater kids, and I always felt like an adopted one since I hung out with them so much. I was so close to finally auditioning for a play my senior year when something came up. Don't go through high school with regrets. If you want to try something, do it. If anything, it's most likely a one time commitment, and you can meet new people. Freshman year grades are so important. | My lowest grades were freshman year, and I think this can be the case for a lot of people. You're adjusting to high school and a new school. It's a lot for a 14 year old, but these grades are the basis for the next four years. Try your absolute hardest because it's so hard to bring a GPA up once it's low. Ask for help. Get tutoring if you need it. Colleges do focus on your junior and senior year grades, but your freshman year grades set your GPA first. Things change a lot. | You will change. Your friends will change. Your dream college will change. Your interests will change. Don't go into high school expecting nothing will change. Even if you don't want it to, something will change, and honestly, it is usually for the better. During these four years, you will grow up so much, and that's such a good thing. Finding a great support system is everything. | There's no way you can go through high school without people supporting you. Find your "tribe" so to speak. Personally, mine was composed of my mom, my favorite teachers, and a couple of my very best friends. These are the people who will help you make all your life decisions and help you when you are at your worst. Hold onto these people through the next four years. Make "friends" with your teachers. | So speaking of teachers, I think this is because I am a teacher's kid, but your teachers are some of the most amazing people. Get to know them. I spent my mornings talking to my former math teachers or my government/economics teacher. You can ask for advice about school or life, and they'll help you. Don't make your teachers seem to be this "big bad" figure. They are humans. Treat them as such. Challenge yourself. It's worth it. | One of my biggest pieces of advice to people is to take chemistry. It's a hard class, but I think it's worth taking because you learn a lot about how to problem solve, which is a skill that will last you through the rest of your life. Find a class like that at your school. Make yourself have to study and learn something new. If you take easy classes all through high school, you probably will not have learned anything. There's no point in keeping negative people in your life. | There's some quote that is like how can you expect to have a positive life if you have negative people in it. I know you want to keep the relationships you have forever, but sometimes people need to grow apart. Toxic relationships are the worst, especially if you are the only one trying to save it. Let them go. You will feel so much better when you don't have a weight of negative energy weighing you down. These 4 years matter very little. | So by the time you graduate at 18, high school will have made up about 23% of your life, which is almost a quarter. That seems life a lot, but by the time you are 22 and graduating college, high school will only have made up 18% of your life. As you get older, high school will start become a smaller part of your life. You have so much more life ahead of you. Don't let four small years control it. School is important but so are your friends. | Like I said, have fun. Sure, you are there to learn and get ready for college, but school isn't everything. Go to your friend's party. See their play. Travel to watch them play a sport. Be supportive in every way you can. One day you all won't be together every single Monday-Friday. You'll be hours away from each other, and that's scary. Spend as much time as you can with them while you have it. It goes by so quickly. Take every moment for granted. | Okay, so these years don't matter that much, but they can be really fun. You're not an adult yet, so you don't have to make too many big decisions. Have fun in high school. As a freshman, it seemed like high school would never end. I mean, having a three year countdown on your phone to graduation is not healthy. Then senior year came, and I thought where did it all go? Take for granted the moments that you have. If you are starting high school soon, I wish you the best of luck!